Aux Ptits Soins and Tommy Rapper gave trainer Dan Skelton a one-two in the G3 Gaskells Handicap Hurdle, the opening race of Randox Health Grand National Day. Grey nine-year-old Aux Ptits Soins, ridden by Skelton's brother Harry and owned by John Hales, in whose colours Neptune Collonges won the Randox Health Grand National in 2012, won by four and a half lengths at 11/1. Tommy Rapper, ridden by Bridget Andrews - Harry's girlfriend - was a 20/1 chance. Dan Skelton said: "I'm in a spot of bother with my landlord [Dan's father, double Olympic gold medal-winning showjumper Nick, who part-owns Tommy Rapper with Judy Craymer], who was second! "We deliberately left Aux Ptits Soins away from Cheltenham, because he's a competitor in those Grade Ones and Grade Twos, but he's a lot more comfortable in handicaps. I knew that if I left him fresh for here, we'd give ourselves the best chance. I did fancy him a bit, and I fancied Tommy Rapper to run well as well. I think with a bit more rain, Tommy Rapper would have been even closer, but it's a great team performance; the pair of them have run their socks off there. "If you watch the race back, you'll see that Aux Ptits Soins professionally negotiated two obstacles - the rest was pretty hairy, but it's about getting over them and surviving, and he did that well. "He's always been a high-class horse. He underachieved in the Cleeve Hurdle, having given us a good day on New Year's Day [when he won at Cheltenham], but you don't want to be fancying him with anything less than six weeks between his runs. "Bridget rides him [Aux Ptits Soins] every day, so it was a bit of a tough pill for her to swallow today, being on the runner-up, but she's a big part of the team. It takes everybody to get them to this point." Aux Ptits Soins (11/1) confirmed himself a class act when travelling strongly throughout and quickening four and a half lengths clear of stable companion Tommy Rapper (20/1) off a mark of 149 in the extended three-mile Gaskells Handicap Hurdle. 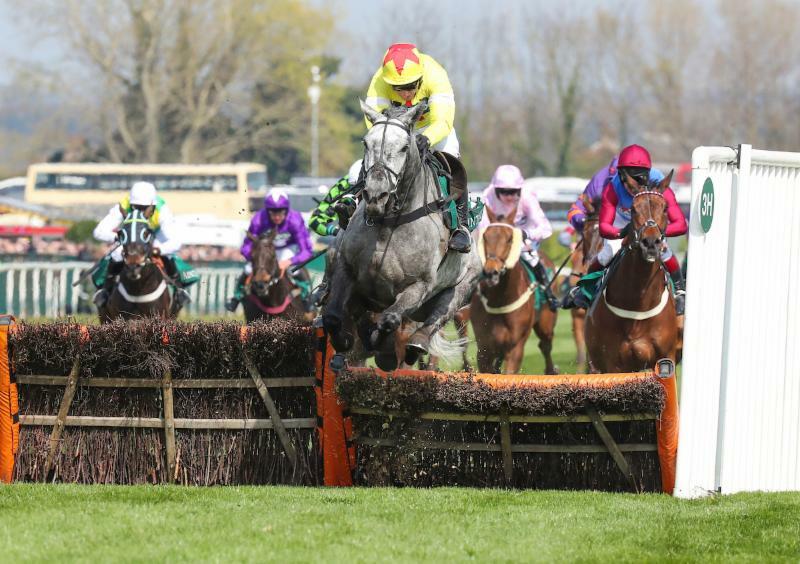 It was a second win of the season for the injury prone nine-year-old grey, who won the Coral Cup four years ago for Paul Nicholls before being switched to Dan Skelton by owner John Hales and had added a further success in a handicap hurdle at Cheltenham on New Year's Day . Jockey Harry Skelton said: "He travelled like a proper horse. I had that feeling once before at Cheltenham and we probably just ran him a bit quick back there in the Cleeve. I'm not saying he's a Grade 1 horse, but he went round like one in that handicap and my job was very easy as when you are travelling like that all that gaps appear and everything happens for you. "I knew once I let him roll from two out that he would take some catching. He's got a touch of class. He's a good horse and we are very lucky that Mr and Mrs Hales very kindly put him with us after he won the Coral Cup for Paul. "John was saying that we need to have a think now but I said to him: 'John, you don't need to think, you just enjoy it!'. He puts an awful lot into horseracing and has put an awful lot of support into us as a family, going back to when dad rode Arko for him in his showjumping days." Hales, who had enjoyed seeing his 2012 Randox Health Grand National winner Neptune Collonges - another grey - parade before racing, said: "Aux Ptits Soins is a class act and always has been. He's had his problems, but when you get him 100 per cent right he's a complete class act and he showed that today. That was a beautiful win and I love him to death. I'm overjoyed." Jockey Bridget Andrews finished second on Tommy Rapper in today's Gaskells Handicap Hurdle, but she needed no introduction to winner Aux Ptits Soins. "I ride him every day, and said he would win," said Andrews with a shrug, after watching her fiancée, jockey Harry Skelton, return to the no.1 spot on the winner. He formed part of a one-two for trainer Dan Skelton, who also trains Tommy Rapper. Aux Ptits Soins (11/1) beat Tommy Rapper (20/1) by 4½l, and there was a further 1½l back to third-placed Keeper Hill (25/1). He was 7l up on the fourth home, Burbank (25/1). Twenty-one horses lined up for the race, but Andrews and Harry Skelton were able to compare their progress on the final bend. Andrews said: "We were nearly upsides turning out of the back straight, when Harry said he was going really well and I said I was going well, but Aux Ptits Soins is in a different league on his day, and he was very good today." Of Tommy Rapper, she said: "We tried chasing him this year, but he's never been a natural over hurdles, and we just hoped he would take to fences. We had two goes, but we couldn't get a clear run with him in training, and it wasn't going to plan, so we decided to go back to hurdling for the rest of the season and try again next year. He's a good horse for sure." Jerry McGrath, who rode fourth-placed Burbank, said: "The first-time blinkers definitely helped him, particularly towards the second half of the race. He stayed on very strongly up the straight, and while he was never going to reach the first three, he ran well and there is plenty to work with." The Gaskells Handicap Hurdle over three miles and half a furlong, the opening race on Randox Health Grand National day 2019, saw the Warren Greatrex-trained eight-year-old gelding Keeper Hill (25/1) finish a good six length third, just run out of second by Tommy Rapper in the last furlong. "He ran really well and am delighted with him," said jockey Richard Johnson, who rides Rock The Kasbah in today's Randox Health Grand National. "He was back in a handicap today having run in the better class Stayers' Hurdle last time. "The ground is drying out all the time, it is good to soft at the moment but it is getting quicker." Keepers Hill did not return to the winner's enclosure for his third placing, but nothing was amiss. "He was just a bit hot so we left up at the top of the straight under the fans," added Johnston. Lambourn-trained Greatrex said: "He is a very straight-forward horse, and he is one of my favourites in the yard. He's run a great race again. The owners wanted to have a go at a big one hence his run in the Stayers' Hurdle last time and he struggled a bit in that, but it put him right for this. "I am chuffed to bits with this run. He'll go novice chasing next autumn. He is fine now, just a bit tired." Harry Skelton, rider of the 11/1 winner Aux Ptits Soins (4/½l), said: "On the slow side." Bridget Andrews, partner of the 20/1 second Tommy Rapper, said: "Good to soft." Richard Johnson, on the third home Keeper Hill (25/1), said: "Good to soft- getting better." Jeremiah McGrath, on board the fourth Burbank (25/1), said: "Good to soft and a bit slow. Amazing with the amount of rain we have had." Jonjo O'Neill Jr, partner of Sire Du Berlais, said: "It is a bit dead." Tom Bellamy, partner of Nadaitak, said: "Dead and tacky." Paddy Brennan, rider of Coolanly, said: "Good." Fergus Gregory, partner of Red Indian, said: "It is tacky." Mark Walsh, on board Forza Milan, said: "On the slow side." Harry Cobden, jockey of Coole Cody, said: "Good to soft." Adam Wedge, rider of Gunfleet, said: "Good, good to soft." Tom Scudamore, partner of Poker Play, said: "Good to soft." Aidan Coleman, jockey of Flemcara, said: "On the slow side." Ciaran Gethings, on board Theclockisticking, said: "It is a bit quicker than yesterday." Henry Brooke, partner of Knock House, said: "Good to soft and a little dead." Charlie Deutsch, jockey of Burrows Park, said: "A little dead." Nico de Boinville, on board Nestor Park, said: "Fairly soft." Harry Bannister, rider of Vive Le Roi, said: "On the dead side." Jack Quinlan, jockey of Canyon City, said: "Good - nearly good to soft." Max Kendrick, partner of First Drift, said: "Good ground."